The U.S. Department of Justice is suing the city of Los Angeles and its former Community Redevel­opment Agency, alleging that they fraudulently obtained millions of dollars in federal housing grants by falsely promising to create accessible homes for the disabled. 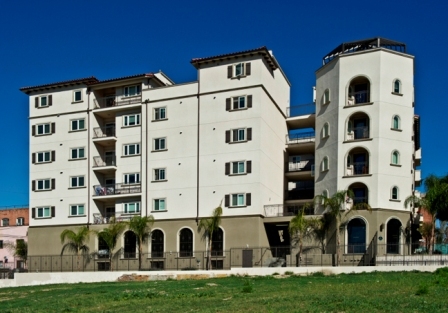 The complaint, filed late Monday in Los Angeles federal court, alleges that as recipients of millions of dollars in funds from the U.S. Department of Housing and Urban Development, the city and the CRA/LA — formerly the Community Redevelopment Agency of the City of Los Angeles — did not comply with accessibility laws meant to ensure the disabled have fair and equal access to public housing. A representative for City Attorney Mike Feuer did not immediately respond to a request for comment. But in June, spokesman Rob Wilcox said the city would fight the lawsuit, which was originally filed by whistleblowers Mei Ling, a Los Angeles resident who uses a wheelchair, and the Fair Housing Council of San Fernando Valley, a nonprofit civil rights advocacy group. The United States elected to intervene in the lawsuit and take over the litigation. The city of Los Angeles “has demonstrated its commitment to create affordable housing that is accessible to all.” Wilcox said at the time, adding that the city has dedicated at least $200 million over the next 10 years to create accessible, affordable housing. Government prosecutors allege the city repeatedly certified its compliance with federal accessibility laws to obtain the HUD funds without taking the required steps to ensure it complied. Many HUD-assisted apartment buildings failed to meet minimal accessibility requirements, according to the complaint. The city allegedly approved the design and construction of inaccessible buildings, with, among other things, slopes and ramps that are too steep for safe passage by ­persons with mobility disabilities; door thresholds that are too tall for wheelchairs to roll over; and steps that prohibit access to common areas. Additionally, the lawsuit contends that faulty designs included kitchen cabinets, shelves and surfaces outside of the accessible reach ranges of persons who use wheelchairs; sinks, grab bars, mailboxes and circuit breakers mounted beyond the reach of wheelchair users; pipes below sinks and lavatories that are not insulated, thereby posing a physical threat of burns to people who use wheelchairs; and insufficient numbers of accessible parking spaces in garages and lots.